Running out of your favourite Scentsy products can be a nightmare! Scentsy Club lets you schedule regular shipments of Scentsy consumables (aka the stuff that runs out) right to your door, so you get it before disaster strikes. Order as many consumables as you’d like. Select shipping options that suit your schedule. We’ll always be working to bring more exclusive benefits to Scentsy Club members! Jacob plays many sports and cares as much about the smell in his carry bag as he does his performance. He uses our Scent Paks to tackle odour. 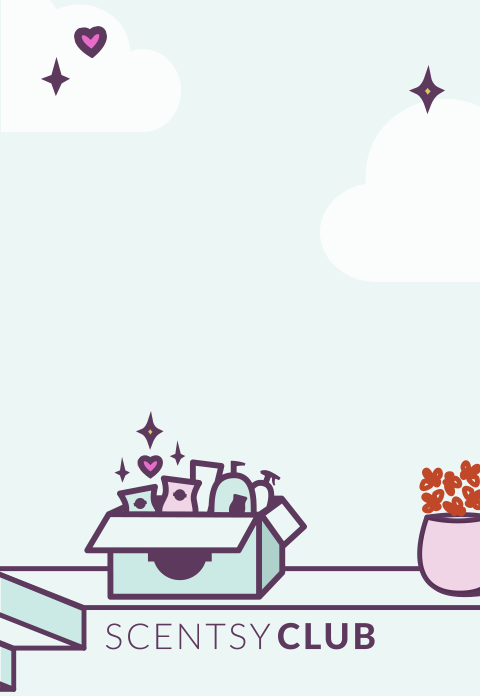 Scentsy Club is a monthly subscription program that lets you schedule shipments of your favourite Scentsy consumables (aka the stuff that runs out) right to your door. Members enjoy exclusive perks when they join. Always Get My Bar is a benefit exclusive to Scentsy Club members. Throughout the year, Scentsy Wax Bars are discontinued to make room for new ones. The problem is, it’s disappointing when your very favourite fragrance is discontinued. But with Always Get My Bar, there’s no need to worry! If we discontinue a bar that’s in your subscription, we’ll keep making it just for you (as long as you keep it in your subscription)! * This even applies to Scent of the Month, Wax Collections and Bring Back My Bar fragrances. *Rules apply. See the next question for details. Are special programs or limited-time offers (LTOs) eligible for Scentsy Club subscriptions or the Always Get My Bar perk? You can subscribe for individual Scentsy Bars from wax collections within 30 days of the collection’s launch date, or throughout the duration of the LTO (whichever is longer). Individual bars from wax collections are also eligible for Always Get My Bar, but please note that packaging may change over time as a bar is discontinued to the general public. See the Always Get My Bar Q&A for more details. Scentsy Bars in limited-time seasonal collections are also eligible for Always Get My Bar if added to a subscription within 30 days of the collection’s launch date, or throughout the duration of the LTO (whichever is longer). See the Always Get My Bar Q&A for more details. When can I edit my subscription? You must finalize all shipment edits 10 calendar days prior to the Processing For Shipment date. Don’t worry, we’ll send you a reminder so you don’t forget! We know how life gets. IMPORTANT: For a discontinued Scentsy Bar being received exclusively through Scentsy Club’s Always Get My Bar perk, you can only skip shipment once in a 12-month period before it is automatically and permanently removed from your subscription. Cancelling an order also qualifies as a skip. We’ve worked hard to provide great shipping rates on Scentsy Club subscription orders around the globe from our facility in Meridian, Idaho, USA. Regular shipping rates apply to any Scentsy Club orders below the lower threshold in the following chart; click here for rates. Is Scentsy Club replacing Customer Loyalty and VIP programs? If so, why? What happens to my existing Customer Loyalty or VIP orders? Existing subscription orders will continue to ship through September 2018. Customer Loyalty and VIP subscriptions will automatically roll over into the new Scentsy Club program for Scentsy Club shipments starting as early as October 2018, allowing you to take advantage of more benefits!